Legislator Francis X. Becker, Jr., joined Nassau County Executive Edward Mangano to announce that they have begun to reform county government by slashing patronage and cutting spending to fill the 2010 budget hole left behind by the previous administration and the repeal of the home energy tax. The County Executive’s $49 million savings plan includes $22 million in cuts from payroll and managerial patronage positions from the previous administration. Additional savings have been gained from careful reviews of the structure of each of the county’s 47 departments. 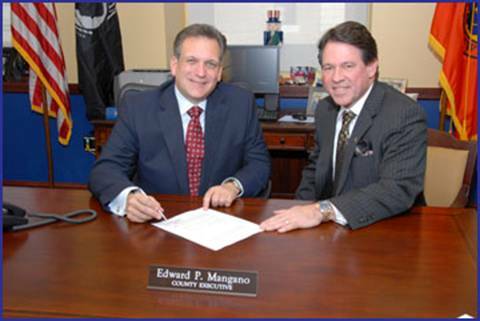 Pictured: Legislator Becker and County Executive Mangano.